Preheat oven to 180°C/300°F. Roughly chop leek and celery. Peel and cut carrot and shallots. Quarter tomato. Set aside. Salt beef. Heat oil in a heavy-bottomed, ovenproof pot over medium-high heat and sear beef on all sides. Add chopped vegetables, tomato purée, and peppercorns and fry for approx. 10 min. Deglaze with beef stock. Cover pot with lid, then place in the oven and roast at 180°C/300°F for approx. 120 min. Throughout roasting, occasionally baste beef with pan drippings. Add red cabbage to a large saucepan and season with juniper berries, cloves, and bay leaves. Warm over medium heat for approx. 8 – 10 min., then keep warm over low heat until serving. Peel potatoes and roughly dice. Add potatoes to a saucepan and fill up with water until potatoes are covered. Salt water, bring to a boil and cook for approx. 20 min., or until soft. Drain the water from the saucepan and add butter and milk to the potatoes. Mash until smooth and creamy. Season with nutmeg, salt, and pepper. Keep warm until serving. Once the roast beef is done, remove from oven. Take meat out of the pot and cover with aluminum foil. Let rest for approx. 10 min. Strain roast beef drippings into a small saucepan and bring to boil. Mix starch and water to make a slurry, then add to saucepan. Season with salt and pepper and let simmer until thickened. 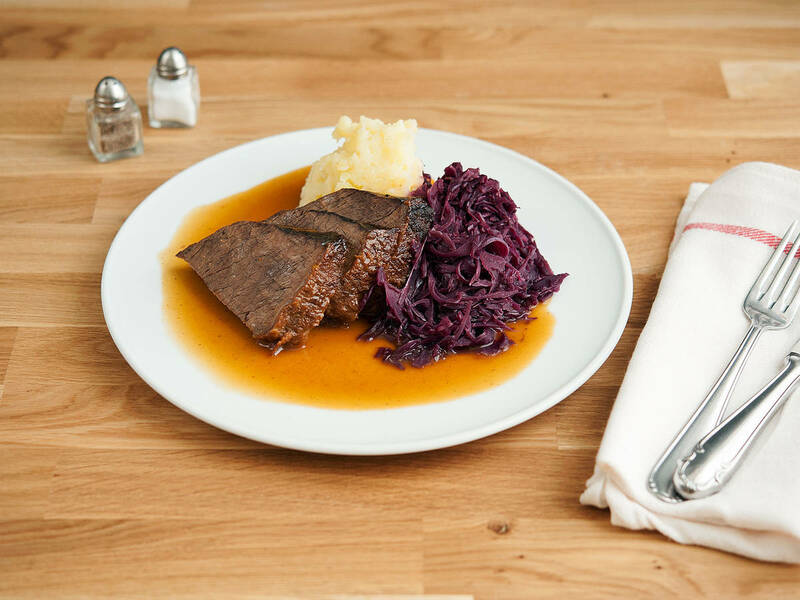 Slice roast beef and serve with mashed potatoes, red cabbage, and sauce. Garnish with parsley and enjoy!